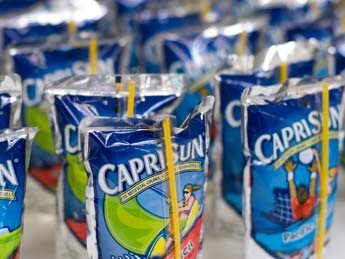 Capri a Sun is a brand of juice drink blends marketed towards children. You can find them in lunch boxes and picnic baskets and Lunchables across the US. They don’t taste amazing, they aren’t that healthy, but they are fun. They come in sealed pouches with a plastic straw. There’s a designated place near the top of the pouch for you to punch the straw through, but all the cool kids punch the straw through the bottom of the bag. It looks cool but it’s not practical because then you can’t set it down at all. Capri Suns haven’t gone through too many changes from when I was a kid, but one noticeable addition are the clear-bottoms. That’s because a few years ago a bunch of moms found mold and bacteria in their kids’ Capri Suns. The clear-bottoms ensure that you can see the contents inside and you can see if you have a moldy juice blend or not. That’s progress.